Set Up: Two teams of 4 or 5 depending on numbers (can be done with teams of 3 as well). Grids can vary in size depending on desired work rate, but 8x12 on each side are good. Activity: Coach plays a ball into one grid. At that time, one player from the opposite grid can enter to try and win ball. After coach-determined amount of time, second player from "defending grid" can enter to help win ball if "attacking" team still has possession (maybe have 5 players count to five and then one can enter). Attacking team tries to make 5 passes for a point. If defending team can win ball and play back to their team, that counts as a point. If ball goes out of bounds, possession goes to team in opposite grid. Coaching Points: Qualities of a Pass: Pace, Accuracy, On the Ground. 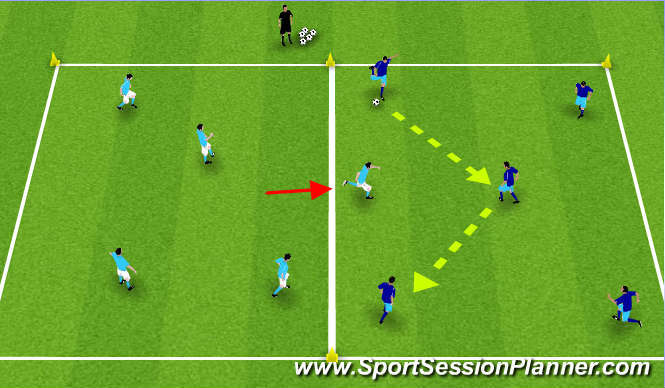 Quick play, making quick decisions, moving the ball away from where defenders are.